Banquets Bartender Bill Burke waits for customers at the Bloody Mary bar, during the Champagne Sunday brunch at the Davenport Hotel. Champagne brunch is good but Bloody Mary brunch is better, and the Davenport Hotel has combined the best of both worlds. During their weekly Sunday brunch, the hotel has added a build-your-own BLOODY MARY BAR. The drink special was installed just four weeks ago, but organizers plan to make it a weekly affair. You can forget about the excruciating pain of your morning hangover in the lush ambiance of the Davenport as you build one grandiose drink with all the garnishes and fixings. But come with a tomato-juice-to-hot sauce ratio in mind: Recipes are not provided. The bartender will start you off right with a spicy salt-and-pepper rim and a healthy dose of vodka. Specialty vodka flavors include tomato, smoked salmon, jalapeno, bacon and cucumber. Next, pick your among V8 juice, Clamato or several tomato juice blends made in-house by the mixologists at the Davenport Hotel. There’s a bevy of hot sauces and spices at your disposal, too. And to top it all off, choose from an extraordinary array of garnishes like pickled asparagus, blue cheese-stuffed olives, celery, pickles and carrots. This Bloody Mary bar makes it easy to get all your vegetable servings eaten in one tipsy afternoon. Keep in mind the Bloody Mary bar rotates — sometimes you’ll find it stationed in the lobby, sometimes it’s in a ballroom. But it’s always available with or without purchase of a Sunday bunch meal. 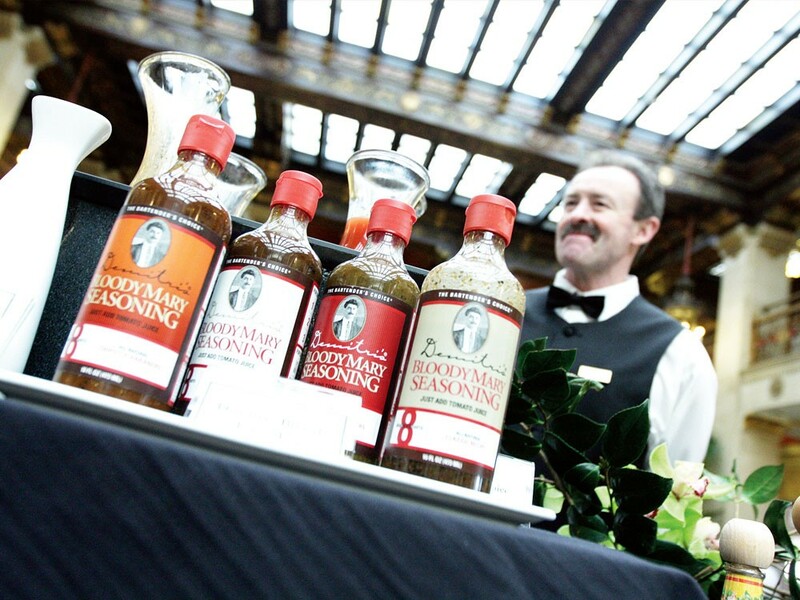 The Davenport Hotel Bloody Mary bar and brunch is open from 10 am-1 pm on Sundays and costs $10 per trip to the bar. Sunday Brunch costs $35 per person ($15, children ages 6-12; free for children younger than 5). Reservations recommended. Call 789-6848. SUSHI I TERIYAKI & GRILL opened in late March on South Regal’s restaurant row. The letter “I” in the name stands for the Japanese word for love, which sounds like “ai.” You can just call it Sushi Love, says Mida Shin, who manages the front of the house. Home to West Wing, Twig’s, Waddell’s and Laguna Café, the addition of Japanese food to the diverse dining scene of this South Hill mini-mall is great; parking is not so great. At lunchtime on a recent weekday, both the main parking area and overflow lot were full. But once you make your way inside Sushi I, owner Jay Shin and his chefs will greet you with an enthusiastic and boisterous hidashai mashi — welcome to Sushi I! Shin, a Florida transplant, came to Spokane to open Sushi Track on North Division for his brother. Now it’s his turn. “This is his dream,” says his girlfriend Mida. Shin looks up occasionally from behind the sushi bar to smile at customers. His warmth is contagious and gives the place a welcoming, neighborhood feel. The menu offers sashimi, nigiri and dozens of specialty rolls ($5- $14), from a basic spicy tuna to the God Father with lobster tempura, tuna and salmon. There’s an extensive list of appetizers including salmon ceviche, baby octopus and several kinds of dumplings. There are plenty of choices for non-sushi fans including teriyaki dishes, tempura, soups and stir fries. The Salmon Teriyaki Lunch Box comes with miso soup, four California rolls, a few gyoza (pork dumplings), a generous amount of salmon and a handful of light, crunchy tempura. For just $10, this beautifully presented bento box-style meal is one of the tastiest and best values around. Shin says he’s trying hard to keep prices reasonable. “We want people to try everything,” he says. With prices like this, friendly service and fresh-tasting, high-quality food, there is a lot to love at Sushi I.